Until this year, I hadn’t really watched any of the older Star Trek movies that came out before I was in my teens, though I had seen bits of The Wrath of Khan when I was very young. Fortunately, Netflix has made this much easier to remedy than it used to be, especially when, after I watched my way through The Wrath of Khan a couple of months back, they actually emailed to inform me they had First Contact available. It’s kind of strange, seeing movies you’ve spent half your life hearing about for the first time. I may be set to see Star Wars tomorrow, but this week it seems a couple of other franchises were doing their best to distract us with trailers. New teasers for Sherlock‘s retro special and Fantastic Beasts, and a big trailer drop for Star Trek: Beyond. Marvel even threw in the international trailer for Civil War, although the last only contained a minimal amount of new footage(it sure provoked the feels though). Both the two new teasers seemed mostly about us getting a first look, be it the Abominable bride, since we’d seen the main duo all decked out in Victorian already, or the Scamanders and a little bit of wizarding America. The Abominable Bride comes across for the later trailer as some sort of horror flick, although proper Sherlock Holmes would insist there is some sort of mundane explanation for a supposedly dead bride coming back to life. The Fantastic Beasts teaser is harder to pin down, though I did like the opening nod back to the opening of the Prisoner of Azkaban movie, and the moment with opening the growling suitcase was very Potterian. I’m less certain how I feel about the big council chamber, but David Yates has always been good at giving us a wizarding world we can believe in. The Star Trek: Beyond trailer, meanwhile…oh dear. That there is a short of the Enterpise apparently crashing makes me wonder if they’re trying to do an alternate version of The Search for Spock, which is a problem when there were no main characters left dead at the end of the last movie. In any case, it did not look from the trailer like such a movie would be more than a shell of the original, all the technical details thrown in but the spirit of it completely wrong. My first reaction to it was to agree with Mr. Crusher’s assessment of the situation, and remind myself that I walked out of this franchise before, and I am perfectly capable of doing it again. Simon Pegg insisting the actual movie is a bit more Trekkian than the trailer is reassuring, especially since trailers tend to be misleading anyway, but I still don’t hold this as a good sign. For me, 2015 has been the year I seriously took the plunge back into fanfic and fandom. I was never fully disconnected, but in recent years I haven’t had much to do with it; I was focused on other things. I was inching in already, thanks to the MCU in general and Agents of S.H.I.E.L.D., but movies don’t come out often enough for me to go full-blown, and Agents of S.H.I.E.L.D. wasn’t the show most suited to it either(at least at first). But then Daredevil landed, and I took the plunge back in. I’ve written more in the past six months than I did during some years, and what I put on the backburner in favor of trying to become a published novelist, I now feel differently about. For better or for worse, I am a fanfic author, that is my identity in life, and I’m learning to embrace it, once and for all. I’ve never been ashamed, but now I’m proud. Let the world scorn me or dismiss me for not being a respectable published woman(though I still might self-publish a book that is essentially Jane Austen fanfic anyway); I don’t give a damn. 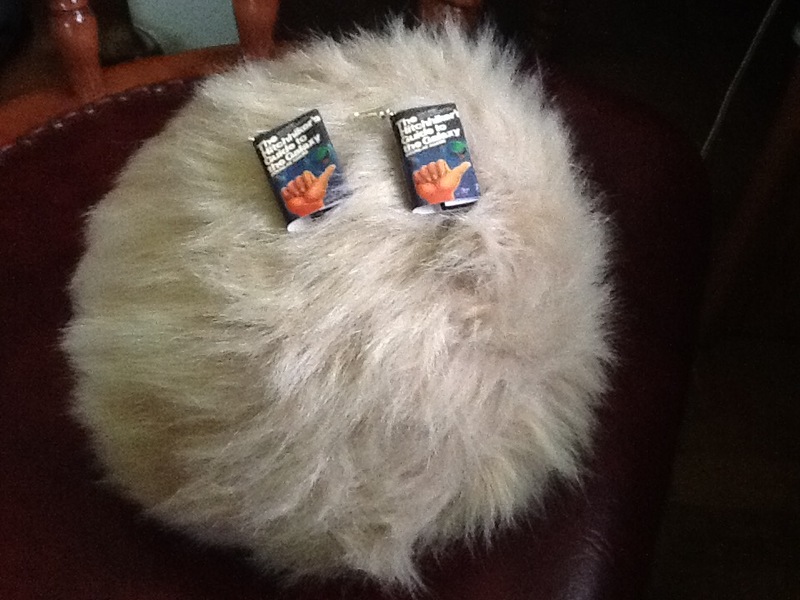 Got a pair of earrings that are tiny versions of The Hitchhiker’s Guide to the Galaxy and a tribble which can coo or screech when you hold it. The spoils of Awesome Con. Organization was far better this year. They moved the convention to a downstairs place and put much more work into the arrangement of all the booths, plus got the entry procedures figured out so that we didn’t have to spend an eternity waiting to get in. Also there was plenty of food on hand. Popular cosplaying subjects included Spiderman(with a number of his various costumes over the years represented), Deadpool(there was one on vacation), and Peter Quill(spotted a couple female ones, plus one who had a Gamora with him), as well as various Jedi(including an elderly Mace Windu), TOS-era Starfleet officers, and Doctors. Was particularly impressed with a Darth Vader who emitted the breathing sound, and took particular delight in spotting a Groot, a Bender, and two Matt Murdocks, one in his day clothes with a bloodied eye, and one in the black outfit. Also two Sailor Jupiters. I hope they went to get William Shatner’s autograph, since he was there signing them. We didn’t attempt to get anyone’s autographs, but we did get a cheap thrill from seeing George Takei, as well as John Rhys-Davies. Disappointed I only saw one Peggy Carter. Perhaps next year I shall dress up as her myself. It is a time of grieving for Trekkies. Nimoy isn’t even our only loss this week; we also lost Maurice Hurley, one of the primary shapers of The Next Generation, and creator of the Borg. But more than anyone else, even Gene Roddenberry, there’s been a feeling that Leonard Nimoy is Star Trek. There has been no character from any of the franchise’s many installments as iconic as Mr. Spock, no other character that has so transcended Star Trek and become part of a our general pop culture. Roddenberry had to fight to keep him on the show after the first pilot, and thank the cosmos he won that battle. Spock was the alien, the symbol of the great universe out there, that was different from everyone else, but was unquestionably a valued member of the crew, his different way of doing things enriching the group. He was also a character we humans could still identify with, especially with his story of being of mixed race, and suffering prejudice as a result-a story all too familiar to Nimoy, who suffered from the same in his youth-being an inspiration to outcasts all over the world. He was also out introduction to the Vulcans, a race vital in shaping the Star Trek universe, one that has always been there and always had their say. And Nimoy, both by his performance and some of his offscreen influences on the character, played even greater a role in shaping Mr. Spock than most actors do. Mr. Spock would never have been Mr. Spock without Leonard Nimoy. Even when another actor took over the role for the reboot, Nimoy was still there to guide the new Spock on his way, and the new James Kirk too, and he more than anything else gave the movies the feeling that there was a true connection between them and all that had gone before. That would be enough of an accomplishment for any man, but it wasn’t Nimoy’s only one. He played other roles too, some of them remarkable indeed. There was also his work as a director and as a photographer, and in the latter he made a point of photographing women with unusual body types and portraying them as just as worthy of being photographed as those who looked more socially acceptable. And a poet; his final public act was to tweet some worthy final words to leave us with. His was a long and prosperous life. RIP.